We have returned just about all in one piece after a fantastic 4 day Tour du Vin in the Loire Valley. With 19 tourists (only 3 tour first timers!) we all arrived from different directions within 5 minutes of each other at our first tasting at Domaine de la Bergerie in Champ sur Layon. We were treated to a fine lunch at their on-site restaurant – that set the tone for a huge amount of eating and drinking over the coming days. Anne Guegniard, head wine maker showed us around the vineyard – then took us through a stunning collection of wines, namely some Anjou red and white, followed by the sweet wines of Coteaux de Layon. Our first hotel of the trip was at the fabulous Hotel Anne D’Anjou in Saumur where we also had a fine dinner at their Les Menestrels restaurant. An early start on Day 2, that unfortunately clashed with Bastille Day, as we travelled to Sancerre to Henry Bourgeois in Chavignol. We were hosted by Jean Michelle who was incredibly informative and amusing. We were then fortunate to try over 15 of their wines! Our hotel for the remaining two nights of tour was at Château de la Bourdaisière near Vouvray in Montlouis sur Loire. After racking up a 500 euro gin and tonic bill, we then went into a sparkling wine reception, followed by a meal at the Chateau. The touring group then took over the drawing room and it turned into a bit of a mega party! 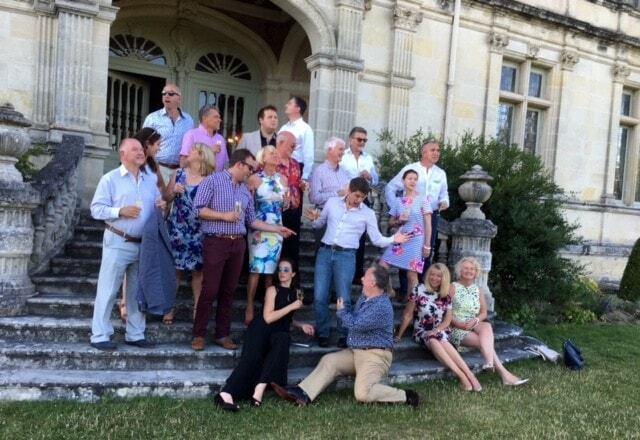 Day 3 was the most action packed day, with 3 wine tastings, a lunch in Chinon, drinks reception, then out for dinner. A real test of stamina but a absolutely brilliant day. First up was a visit to Marc Plouzeau in Chinon – I had visited him before and this was a very enjoyable visit hearing looking around his vineyard, chateau and then trying his super selection of wines. After lunch (only 2 courses this time!) in Chinon, we head to our final two tastings just around the corner from our hotel in Vouvray. Marc Bredif was our first stop, where we had a very interesting tour around their caves, where they even had some sweet wines dating back to 1874! After much indulgence in the Bredif wine shop, we head to our last tasting down the road at Chateau Gaudrelle. Owner and head wine maker – Alexandre Monmousseau showed us around and was incredibly interesting and amusing as many of the touring party were enjoying his stories and his fine selection of sparkling and sweet wines. Our last night on tour and we jumped into cabs and popped into Montlouis sur Loire for dinner at La Tourangelle. The last supper on tour and suprisingly the most lively. Fines master Martin Athey held another amusing court session and raised enough funds over the 3 days to cover our hotel bar bills! Thank you to a fantastic touring party that made the trip most enjoyable. It was an action packed trip – but enjoyed thoroughly by all. Here’s to the next tour in 2 months time to Portugal where we will be visiting Dau, Douro Valley and Porto. Please email charles@waudwineclub.com if you would like to attend the tour.